“Baahubali : The Begining” first week collection is beyond the prediction and it is another record set by an Indian movie. With it’s first day Massive opening Baahubali’s income crossed Rs 60 Cr inr and now after it’s 1 weekend ( 3 days) another milestone completed with 160 Cr earning by “Baahubali : The beginning“. 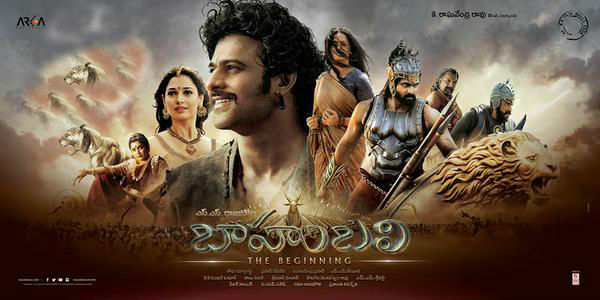 On this Friday Tollywood eagerly awaiting movie Baahubali: The beginning has been released. As the expectation this movie brakes all the previous records and makes a new history of highest first day box office collection. Audiences highly appreciate the works done by all actors in the movie. Rajamouli’s epic on-screen saga Baahubali is doing great business every where even in the dubbed languages. Baahubali set another record of highest earning dubbed movie on opening day. Baahubali is directed by SS Rajamouli and film stars Prabhas, Rana Daggubati, Anushka Shetty, Tamannaah Bhatia in lead roles. Baahubali has been made with Rs. 250 Cr Budget and this movie is divided in two parts. Baahubali : The beginning is the first part that destroyed all the previous record made by Bollywood or Tollywood movies. First day (Friday) Collection Rs. 60.00 Cr. Second day (Saturday) Collection Rs. 42.00 Cr. Third day (Sunday) Collection Rs. 58.00 Cr. After watching the Baahubali movie audience feeling amazing with the high quality of VFX used in this movie. Many people are also saying that you can take full advantage of your movie ticket investment only with the VFX. Although, reportedly Baahubali: The beginning already cross the Rs. 150 Cr. magical figure of box office business within first three day of its opening. Now it’s expectation is very high with this movie. Defiantly now team of Baahubali look at another record of Rs. 500 Cr., there is no doubt that SS Rajamouli directed this film have the ability to cross this megical figure but it’s interesting that how much time it takes to reach Rs. 500 Cr. cloud touching figure. From Bollywood very few movies reach Rs. 500 Cr. but this time Baahubali first week end blasting box office collection shown that this movie will cross this magical figure in coming week. Although this weekend Baahubali: The Beginning is one of the single big budget and high promoted movie which has been tracked on approx. 4000 multiplex theaters globally, so it took a big benefit of single release. But coming weekend Baahubali will be big competition with Bollywood superstar Salman Khan Starrer another high budget Bollywood film Bajrangi Bhaijaan. Its Eid celebration on this weekend and Salman Khan is all time favorite of Bollywood fans and oversees movie lover. Thus it’s a tough competition for Baahubali after release Salman Khan Bajrangi Bhaijaan.